A discussion on writing SQL scripts and some quick examples. In the previous lesson, we added data to our database table using the "Edit Top 200 Rows" option. In this lesson, we will look at how to write SQL scripts to update and run queries against our database. SQL scripts can be used to insert data, read data, update data, and delete data. They can also be used to create database objects such as tables, views, stored procedures, and they can even be used to create whole databases themselves - complete with tables, data, users, etc. 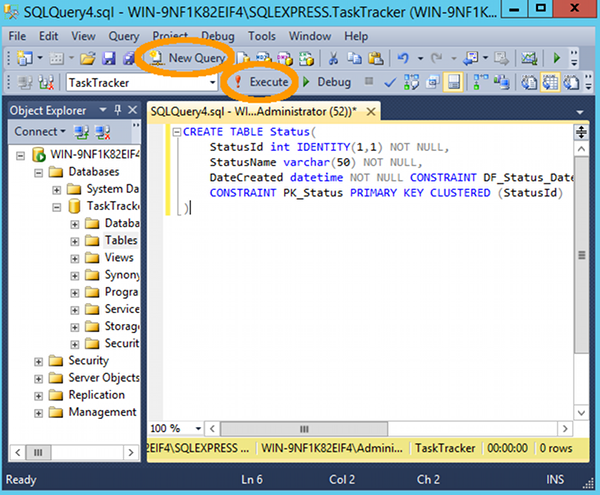 SQL Server supports Transact-SQL as a scripting language. Transact-SQL is based on SQL (Structured Query Language), which is the programming language used to interface between applications and their databases. Transact-SQL is a relatively easy language to learn and I highly recommend becoming familiar with it. Whenever I refer to a SQL script here, I mean a Transact-SQL script. SQL scripts are usually made up of one or more "statements". Each statement tells SQL Server what to do. SQL scripts can contain many statements. For example, a SQL script could contain a statement to CREATE a table, another statement to INSERT data into that table, and another statement to SELECT all the data that was just inserted into the table. In fact, SQL has specific statements that are used for those exact three things: the CREATE statement, the INSERT statement, and the SELECT statement. Generally speaking, your statements will begin with the word of the task that you're trying to perform. If you're trying to create a database object, your statement will start with CREATE. I say "generally speaking" because, there are some other bits and pieces that you can throw in to a SQL statement that may come prior to your statement. SELECT TaskName FROM Tasks WHERE StatusId = "3"
The above statement selects the TaskName column from the Task table, but it only returns those that have a StatusId of 3. The value of 3 could mean "To Do" or "Done" or whatever it is we want it to mean. In our TaskTracker database, we'll be creating a new table called Status where we'll specify what "3" means (and "1" and "2" of course). These numbers are simply the values in the StatusId field (which we specified as an Identity column - an autonumber). Each of those numbers will have a corresponding value in the StatusName field which will tell us what status it actually is. Then, once we've created our Status table, we could modify the above SQL statement to include the Status table so that we can write WHERE StatusName = "To Do" instead of trying to remember what number "To Do" is. Below is a SQL script that will another table on our database - a Status table. If you aren't familiar with SQL it might look a bit weird. But I'm sure you'll have some idea of what it does when you see the names of the columns and their corresponding data types. In this script, we aren't allowing any NULL fields (hence the NOT NULL next to each column). We're also creating a primary key for the StatusId field, and we're setting a default value to the DateCreated field to (getdate()). Once the script has run, you should see a message that reads Command(s) completed successfully. You can also run a query by pressing F5 on your keyboard. 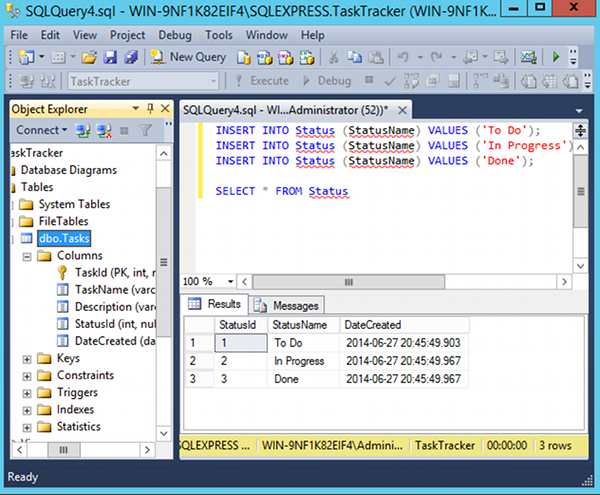 Plus, you can even run part of a query by selecting the part that you want to run, then pressing F5. This works well on larger scripts that contain a lot of SQL statements, but when for some reason, you only want to run one or two (or even run all of them but just one at a time). You can also add data via a SQL script. The script will use the INSERT statement to insert data into the tables that you specify. You can have the script insert data into all columns in the table, or just those that you specify. As you can see, the results of the query are displayed in the bottom pane. Now that we've got our Status table, let's add a value to the StatusId field of the Tasks table (remember we left that field blank for all records because we didn't yet have the Status table). So the value we add is going to link the Tasks table to the Status table. Each record in the Tasks table will now have a StatusId which will be either 1, 2 or 3 (to match a value in the StatusId field of the Status table). To do this, we'll need to use an UPDATE statement (because we're updating the records rather than inserting new ones). Actually, we could just have easily combined all of the above scripts and run them as one. I only kept them separate in order to make it easier to understand which part does what. If you'd like to learn more about creating SQL statements, check out my SQL tutorial. Most of the database administration tasks (such as creating users, backups, etc) that can be performed in SSMS via the graphical user interface can be performed programatically via SQL scripts. This tutorial concentrates on using the graphical user interface, mainly because it's usually a lot easier for new users to get their head around. Once you become more familiar with SQL Server, you may find yourself using SQL scripts to perform many of the tasks that you started out doing via the graphical user interface. Next we'll look at the query designer.